Pincushions are a great way to use up scraps! They are nearly instant gratification projects. Make several pincushions... some to keep and some to share with your sewing friends! Paper piecing skills are required for the flying geese and pineapple pincushions. 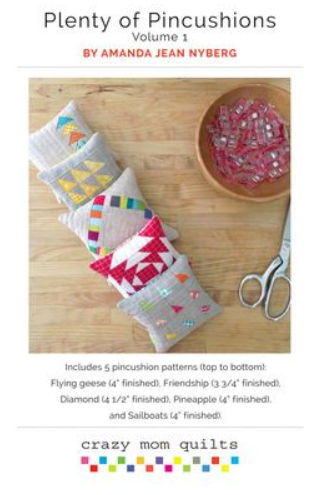 This pattern includes instructions for 5 pincushions: Flying geese (4" finished), Friendship (3 3/4" finished), Diamond (4 1/2" finished), Pineapple (4" finished), and Sailboat (4" finished).